Doosan Heavy Industries, which is also under the umbrella of Doosan Group, is heavily involved in multibillion dollar overseas projects including desalination plant construction projects in the United Arab Emirates and other Middle East countries. Doosan Industrial, a construction arm of Doosan Group, said on Aug. 8 that it manipulated accounting records between 1995-2001 to inflate profits by 279.7 billion won or about US$280 million. Doosan said in a public notice it had inflated sales figures from 1995 to 2001 to survive competition and the 1997 financial crisis when South Korea was brought under IMF bailout package, and decided to reflect the entire amount on the ledger in the second half of the year to correct the past malpractice. The Financial Supervisory Commission said it would not immediately launch an investigation into Doosan. Doosan Industrial Development Company had been the subject of a dispute between two brothers, former Doosan Group chairman Park Yong-oh and incumbent chairman Park Yong-sung. The company is currently exempt from class action suits under a bill passed by the National Assembly in March that gives companies a grace period until the end of next year to voluntarily correct past accounting malpractices. Although they said it didn't target the former chairman, the disclosure came days after Park Yong-oh accused his brothers of managing a large amount in slush funds, when he was forced to resign as Doosan chairman. The former Doosan head is certain to face an investigation regarding the accounting irregularities in a prosecution-led probe, which had initially targeted allegations of Doosan's slush funds. It is not clear whether financial authorities were aware of the fraud. If creditors knew of Doosan Industrial Development's financial problems, the company might have put into a serious trouble,' the official said. Park's brothers was ousted him from the group's management last month after his demand for control of Doosan Industrial Development was rejected. Park filed a complaint with the prosecution to investigate allegations that his brother Park Yong-sung, chairman of Doosan Group, and other group leaders stashed 170 billon won in slush funds through accounting fraud involving subsidiaries. Following the confession, share prices of Doosan Group subsidiaries fell sharply on the stock market. Doosan Industrial Development will be subject to higher debt-to-equity ratio to settle its accounting problems, but it will have a limited impact on its finance. In the months to come, Doosan Group may exert efforts to improve overall accounting transparency, and that can have a positive effect on the group's future in the long term. The Supreme Public Prosecutors' Office is now expanding the probe into the complaint filed by Park Yong-oh. Last month, Park claimed that Park Yong-sung and other Park family executives sought to expel him from the group management out of fear that he would divulge their financial irregularities. 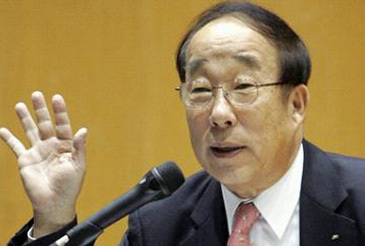 During an emergency family meeting convened after the complaint was filed, Doosan Group honorary chairman Park Yong-gon said Park Yong-oh is attacking his brothers out of greed. ``Park's behavior is a treacherous act against both the family and the entire Doosan Group. He is no longer a member of either Doosan Group or our family and he will be expelled,"' Park Yong-gon said. The Fair Trade Commission said it is looking into the accounting books of two Doosan Group subsidiaries that were allegedly used to collect slush funds by the Park family. The anti-trust body is likely to seek legal action against Doosan executives involved after the investigation ends. The investigation into the slush fund scandal is expected to pick up speed with the prosecution set to call in a number of Doosan executives for questioning. Doosan Group chairman Park Yong-sung and vice chairman Park Yong-mann may receive a summons regarding the inquiry.